Happy Easter to all of my followers! A prayer for you, as you celebrate Easter with family and friends. Feel free to print out and read before your Easter meal. "Dear Lord, we thank you for bringing us your Son, our savior Jesus Christ. 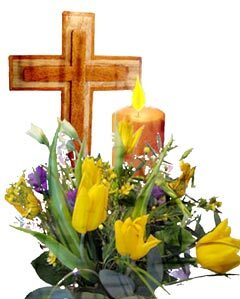 As we celebrate His resurrection with our loved ones, we ask that you bless those who cannot be with us. We are thankful for being able to share this meal with our family and friends, and ask that you bless this food we are about to eat. Jesus is the light of the world and we pray that He continues to guide us, letting His light shine through us so others may come to know Him through our actions and in our words. Thank you Jesus for giving us a very special gift... the gift of one another. Help us not to take for granted the love of those around us, the time shared among us, and the food you set before us. Amen." Click Here for a printer-friendly version of this prayer.